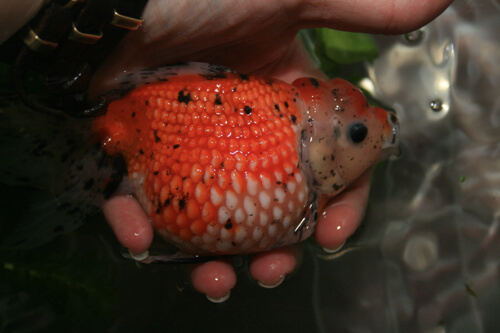 Dropsy can result from bacterial infection and when fish have it their bodies will swell due to the growth of fluid within their tissue. This does tremendous damage and if left untreated it is very unlikely that the fish will recover. Dropsy is technically not a disease itself but rather a symptom of another condition. There are a number of factors that can cause this condition. Some include organ failure within the fish, as well as poor water conditions or chemistry. Performing a diagnosis at home is difficult on fish which are still alive, but you can still test the water chemistry and quality. You can also inspect the fish gills to look for parasites or other signs of illness. If the problem rest with the water or another disease that can be treated it is likely the fish will recover. This condition is easily recognizable due to the distinct swelling that the fish will manifest. Fluid will collect within the body cavity of the fish and they will swell up to great size. The fluid will enter the tissue and ultimately the spaces between the cells which will make the scales lift away from the body, an effect which has led to the condition being nicknamed “pine cone disease.” Additionally, the eyes of the fish may also swell and bulge. Many experts advise the fish being treated through the usage of a remedy which is anti-bacterial once dropsy appears. However, unless there are explicit indications that a bacterial condition is present then this approach may be ineffective and can even make the problem worse. When it comes to this particular condition it is extremely important that the underlying cause be discovered before treatment is applied. Otherwise, you run the risk of placing additional stress on the fish. The very first thing which should be done is an evaluation of the water quality. If the water is fine then you’ll next want to inspect the fish itself. If the fish is inside a pond or aquarium with other fish it should be quarantined immediately. If nothing is seen on the fish which indicates its condition it may be best to call a professional who specializes in fish illness to get an assessment from them before taking further action. The fish may have a disease which is in the early stages and is hard to detect, but professionals will have the knowledge and skills to do so. Getting an accurate diagnosis is critically important as failing to do so will worsen the problem. At most you can add a bit of salt inside the water which will assist the osmoregulatory system of the fish which may reduce the excess fluid. However, you should not add Epsom salt as it will not be effective. Instead, use sodium chloride and if the fish has swollen to great size it is likely that treatment will not save it since the pressure resulting from the fluid would have damaged its organs too extensively. We strive to give our customers the best service possible. Call or email us for inquiries, questions, or anything else. If you live in the area please stop by our retail store. Copyright ©2019 Fitz's Fish Ponds.